The Aspen Leadership Galas takes place on December 7 and has come to be a pinnacle of the Aspen Institute Romania’s ever richer annual programming. Among all our events this is maybe the most personal to each and every member of the growing Aspen Romania community. 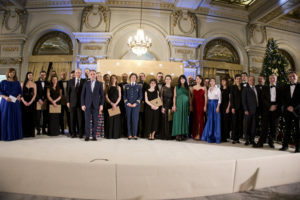 The Gala honors the current Young Leaders Program generation for its accomplishments in the past year in the ambitious attempt of producing a significant impact on societies across Central and Eastern Europe. Also, through the Aspen Leadership Awards we acknowledged specific efforts and personal commitment to values-based, creative and transformative leadership of people that have had a significant contribution to the overall advancement of society. It is an evening that allows us to ponder with some pride at what we have achieved but also gives us trust that the work we have done is important. You may find photos of the event on our Flicker account. “Serge Moscovici” Values-Based Leadership Award: Michel Barnier, Special Adviser on European Defense and Security Policy to European Commission President Jean-Claude Juncker. Michel Barnier, a French politician, became in 1978 the youngest elected Member of the French National Assembly. He subsequently served this region for 17 consecutive years during which he launched the candidacy and served as Co-Chairman of the organizing committee of the 1992 Winter Olympic Games in Albertville. In 1993, he was appointed Minister of the Environment and then Minister of European Affairs in 1995. In 1999 he joined the European Commission as Commissioner in charge of Regional Policy and the Reform of European Institutions. In 2001 he chaired the Working Group on European Defense as a member of the Presidium of the European Convention, drafting the European Constitutional Treaty. He returned to national politics in 2004 as Minister of Foreign Affairs of France. In 2006, Mr. Barnier became the Vice President of Merieux Alliance, a leading global actor in the field of biotechnology and diagnostics. In the Barroso II Commission (2010-2014) he was one of those leading the ‘Defense’ Task Force and oversaw the European Commission’s Communication on European defense markets presented to the European Council in December 2013. He was appointed in 2015 by President Juncker as Special Adviser on European Defense and Security Policy. Michel Barnier has written and published on a number of subjects, notably on the European integration and on questions of the environment. The “Serge Moscovici” Values Based Leadership Award is presented to a public leader or national organization that has excelled in his field of activity, by constantly supporting and promoting national and universal values. Serge Moscovici, after whom the award is nominated, was one of the founders of social psychology and former director of studies at the School of Advanced Studies in Social Sciences in Paris. He was director of the Laboratory of Social Psychology and founder of the European Laboratory of social psychology at the House of Human Sciences in Paris (1976-2006), first president of the European Association of Experimental Social Psychology and from 1974 till 1980, the president of the Committee on Transnational Social Psychology of Social Research Council. He was honorary president until his death of the “Serge Moscovici Global Network”, founded in 2014, at the House of Human Sciences Foundation in Paris. The Romanian National Rugby Union Team, nicknamed The Oaks (Stejarii), is Romania’s representative side of the rugby union. It is considered one of the stronger European teams outside the Six Nations and it has competed in every Rugby World Cup since the inaugural tournament in 1987. Their best finish was with one win in almost all World Cup tournaments. However, they lost all pool matches in 1995 and 2011. Although not regarded as a top-tier team in more recent times, The Oaks won against four of the Six Nations Championship teams (France, Italy, Scotland and Wales). Their spirit of sportsmanship and brotherhood has always been a source of inspiration for Romanians regardless if they were rugby fans or not. In terms accomplishments, the Romanian national rugby union team has received several honors. Noteworthy is the Bronze Medal from the Rugby union at the Summer Olympics in 1924, nine titles from European Nations Cup, five Antim Cups and also three titles from the World Rugby Nations Cup. Still, their contribution to the joy of their public is impossible to quantify and promoting virtuous values for young generations has always been an accomplishment. The Oaks recently had the biggest ever comeback in the Rugby World Cup History, winning against Canada with 17-15 after an amazing 17 straight points. The Sports and Society Leadership Award is presented to an individual or a group who has transformed sports into more than a physical activity. As the great Nelson Mandela put it “sport has the power to inspire, to unite people and it speaks to youth in a language they understand. Sport can create hope where once there was only despair”. The nominees for this award stand as a model of commitment, dedication and professionalism. The 2015 Sports and Society Leadership Award is presented by Raiffeisen Bank. The Service with Dignity Leadership Award is presented to a Romanian public servant that has proven constant effort to exemplary fulfill work duties and go beyond those, as a role model for the community. By their impeccable professional and ethical standards those nominated for this award are seen as guardians of the Good Society, leaders among their peers, and as a source of pride and inspiration.This award is offered in the memory of George Pomutz who was a Brevet Brigadier General in the United States Army and later a career American diplomat of Romanian descent. His sense of duty, diplomatic abilities and moral high ground made him one of most respected individuals by his peers. In 1866, he was named Consul General of the United States to Saint Petersburg, where he participated in the negotiations for the purchase of Alaska. The Power of Storytelling is an annual conference that was built around the idea that stories can change our worlds. The 2015 edition was the only one of its kind in Eastern Europe. The Power of Storytelling brings together the very best storytellers from all fields. Either from media or arts, from the business sector or numerous local projects, this conference shows the potential of stories to connect people, to heal wounds, to move to action, and most importantly to drive change. This conference was started out of the belief that stories are for everyone with in-depth and intimate narrative journalism shaping the stories for different types of public. As such, writers, producers, artists, communicators, marketers, activists, entrepreneurs, and community leaders were all attracted and became part of this project. The speakers, including multiple winners of Pulitzer Prizes, National Magazine Awards, and Emmys represent the best practitioners in their respective fields. Every year, writers, editors, producers, digital innovators, filmmakers, entrepreneurs, and musicians join in a collective storytelling festival. The event has an invaluable contribution in promoting strong values and bonds in the synergy of interdisciplinary fields that is generated with every edition. Also, the fact that it promotes independent journalism and creates a hub for the support of a new generation of media is instrumental in the context of a region where large conventional media trusts are still monopolizing the public agenda, with relatively low access to alternatives. The Contribution to Romanian Cultural Patrimony Leadership Award is presented to an individual or organization who has significantly contributed to the enrichment of Romanian culture, promoted Romania abroad and supported the overall development of the country’s cultural patrimony. The 2015 Contribution to Romanian Cultural Patrimony Leadership Award is presented by UniCredit Bank. Dan Vodnar, a researcher and a young scientist of the Romanian city Cluj-Napoca, the inventor of anti-microbial packaging derived from gastropod shell, algae and other natural ingredients has become the first Romanian to receive the Danubius Young Scientist Award, created in 2011 by Austria’s Federal Ministry of Science and Research (BMWF) in cooperation with the Institute of the Danube Region and Central Europe. His invention, anti-microbial packaging, would make possible the protection of foods, particularly meet products, against listeria contamination, a bacteria that can trigger food poisoning and that has been proved to produce 15 % of the food poisoning deaths. Dan’s inventions also avoids the ingurgitation of preservatives by consumers. Dan Vodnar has qualified for the semifinals of the European Social Innovation competition 2015 and he was included in the ranking “100 Personalities and Ideas that Move Romania” by a reputed Romanian foreign policy magazine. The Innovation and Technology Leadership Award is presented to a leader or an organization which brought significant contribution in the field of innovation and research, or the entrepreneurial environment. Innovation stands as a cornerstone to social and economic progress. Radio France International Romania has been one of the voices of professionalism, stability and a source of trust in the Romania media environment in the past 25 years. It raised the quality standard of programing and established a special level of respect towards its audience. Equally it opened and maintained a critical societal link between Romania and France. As such, not only it contributed to anchoring Romania in Europe but it also offered a francophone and Francophile angle to world news. Through its French language programing it contributed to multilingualism and strengthened the intellectual value of media programing. Finally, by attracting and supporting young journalists, it created an oasis of performance and a pool of talent that continues to raise the standards of journalism in Romania. All these underline the critical role RFI and Luca Niculescu have played in building a Good Society in Romania. The “Andrei Postelnicu” Excellence in Media and Public Communication Leadership Award is presented to a journalist, public communication project, or a media organization which brought a significant contribution in the field of freedom of media, public responsibility and information or the quality of public communication environment. The award is offered in the memory of journalist Andrei Postelnicu, a dear friend and contributor of Aspen Institute Romania who lost his life in a flight accident in 2014. Andrei Postelnicu worked for Moody’s Investors Service, based in London. He had more than 12 years of experience as a financial journalist and writer, having worked across print, online and broadcast media in both developed and emerging markets. He has worked at or collaborated with a wide range of news and research organizations including The Financial Times, Bloomberg, the Economist Intelligence Unit, Foreign policy magazine, Newsweek, the British Broadcasting Corporation, CNN.